Description: NS 11R westbound near MP 54 on the NS Lurgan Branch. Description: 24Z enters NJ @ 1153h. The train detours via Lehighton, Pa due to bridge re-decking in central Pa. Description: NS 6638 leads L42 to the diamond at CP-79. Description: Running long hood forward as NS and God intended, the Z329 rounds the curve at MP 256 on the ex-Big 4 Indy Line. 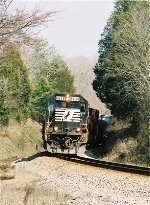 Description: NS 123 approaches CP-230 on the Frankfort District near MP 176. Title: D68 heading back to Princeton, IN. Title: NS 6638 Westbound mixed freight cruises at a steady 45mph towards KC with radioactive cars at the end of train at mp 47. Description: NS 38G with SD60 6638 leading D9-40CW 9912 and SD70M-2 2671.